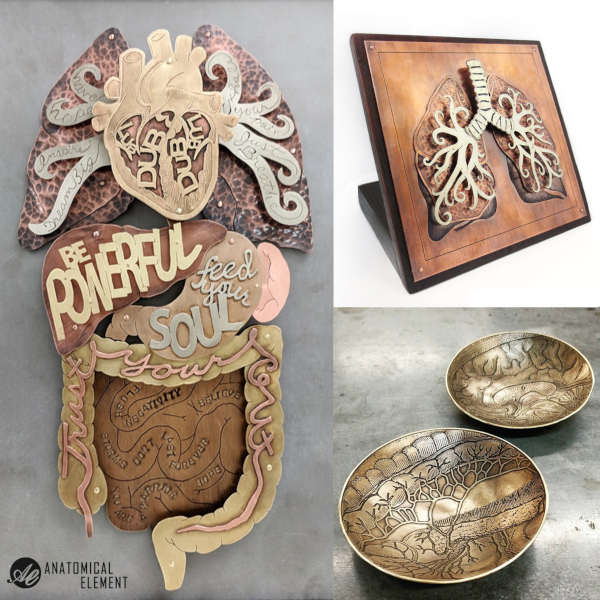 The work of Rachel Stork Stoltz comes to life at an intersection of seemingly mismatching disciplines: medicine and arts, anatomy and metalsmithing, invisible (health) conditions and palpable hand-crafted items. Rachel has spent years working as a medical illustrator and has cooperated with physicians and surgeons on creating visual educational online programs for advancement of effectiveness and teamwork during surgical interventions. Realizing that shed had been spending too much time sitting at the computer and craving for real-life creation, she took up metalsmithing classes and reached a turning point. 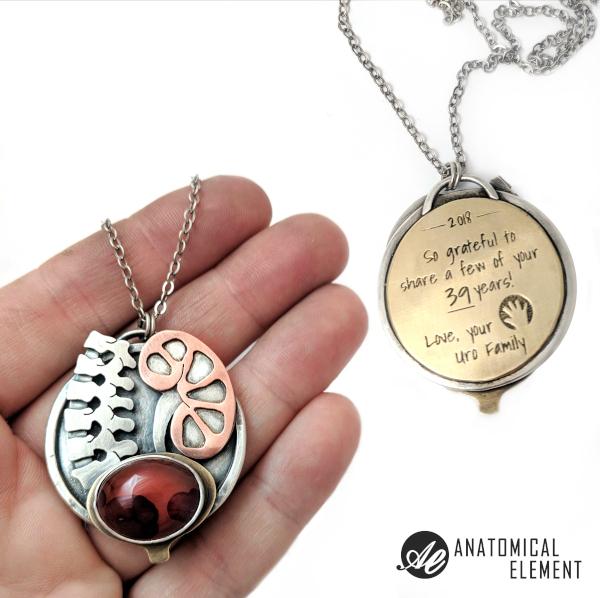 Still led by a passion for seeing anatomical elements in everything, Rachel started making jewelry and anatomical items based on her personal experience and stories of health challenges, living with chronic diseases, loss, recovery, acceptance. 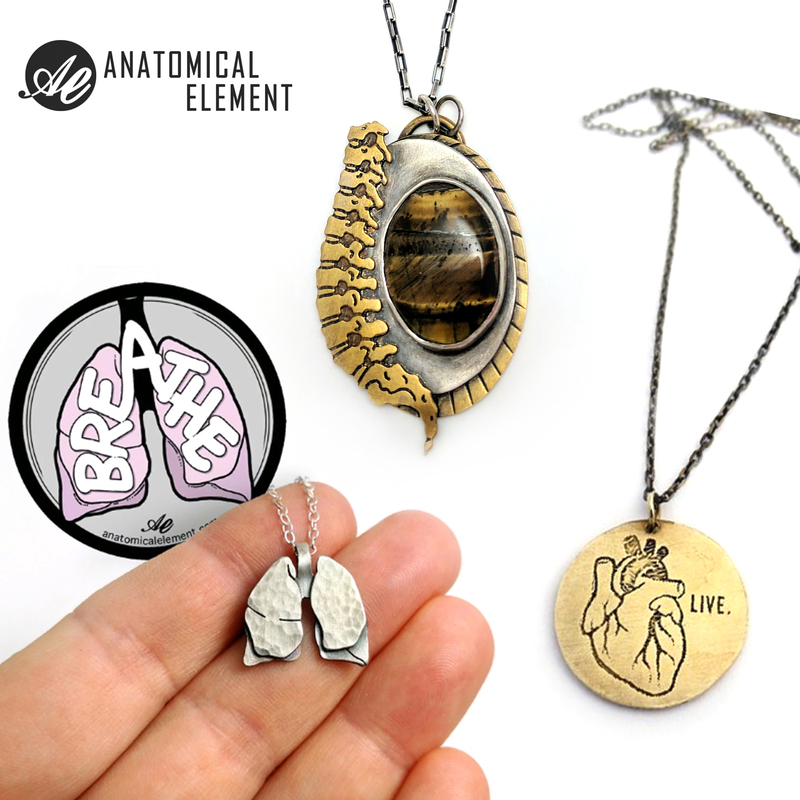 Anatomical lapel pins, earrings, pendants, necklaces – each and every piece of her jewelry is a personal symbol, a kind of a talisman or a visible memory of an internal change. Rachel Stoltz’s jewelry sheds light on what the body memorizes. Her creative work changes the social narrative on invisible disabilities and chronic diseases, contributing to their destigmatization. – Wear Your Insides Outside – says a caption greeting visitors of her Anatomical Element online shop. 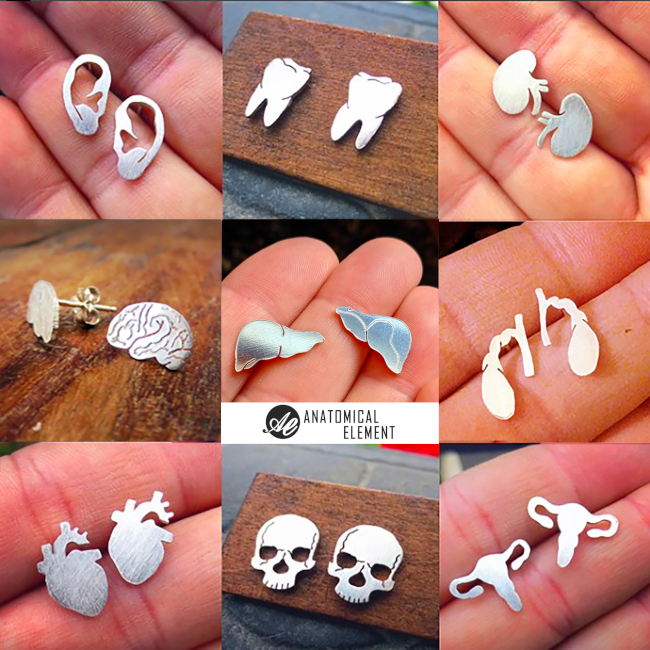 – I make handmade anatomical jewelry & metalwork. I aim to give a visual voice to invisible illness — creating products to promote awareness, celebrate a journey, or honor those lost. Were you more inclined to art or science during the childhood? – I think it was a solid mix of both. My mother was an art teacher so I was provided great instruction at an early age, but I was also very interested in discovering and experimenting with nature. My science lab notebooks were always well written and illustrated. I knew that I needed to find a career that combined both somehow. How would you explain the correlation between art and medicine? What are the major links and how did you discover them? – The body is an art form itself and when I was learning human anatomy in school, the best way I found to learn was to draw it. I was able to visualize processes and functions better with illustrations and commit more to memory. Using art to communicate science or medicine can engage a wider variety of people. What motivated you to start creating medical sculptures? – I was working at the children’s hospital and spending numerous hours staring at a computer screen. I wanted to take classes learning something completely new. Metalsmithing got me away from that screen and got me creating something physical with my hands. My worlds collided in the best of ways when I started making anatomical metalwork. I never wore much jewelry growing up so trying to create fashionable items was not my strength. As I learned more techniques, I wanted to challenge myself by making bigger things like sculptures, reliquaries, and functional items. What was the first piece of jewelry you’ve ever made? – During my first metalsmithing class, we were told to begin with a simple shape. Most students chose circles, stars or graphic hearts. I chose an anatomical heart that I sawed out, layered and riveted together into a necklace. I still have that piece. What’s your favorite or most inspiring ‘made-to-order’ product? Tell us the story behind it. – I have so many! 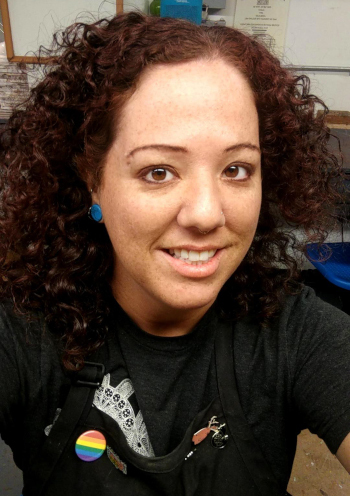 One of the most inspiring stories was from a woman recently given a grim prognosis. She asked me to create a sterling silver anatomical intestines necklace not to be worn, but to be used as an offering. She was having surgery for cancer and asked me to include a note from her in the package and send it to Greece where it would be placed at the Temple of Asklepios, the Greek God of Medicine. I created the piece more easily and with more accuracy than I had ever before. I followed her instructions, shipped the piece to Greece and wrote her a note that everything had been completed. Almost a year later I heard back from her. After surgery and chemo, the cancer was gone! She had beaten the odds and thanked me for helping contribute to her recovery. I love that my artwork can help bring comfort to those who need it and that I can be a part of things bigger than and different from myself. How would you explain the meaning of talisman to someone who never heard of it? – A talisman is an object thought to provide protection or bring good luck to the person who owns or wears it. With my work, it is the owner’s belief system that instills power in the piece. I create each item by hand and always try to be in a positive frame of mind while making it, so as not to transfer any negativity into the piece. Can you describe the creative process of jewelry making? What materials and techniques do you use? – Before starting a piece I do research to be sure the structure I’m creating is anatomically correct (as much as is intended). Each piece is illustrative in nature using layers of hand sawn metal to creative depth and dimension. Much of my medical illustration is created with Adobe Photoshop in multiple layers of drawings and shading. When creating a piece of jewelry, I think of each layer of metal like a layer in Photoshop. I use patinas as I would carbon dust for shading. The jeweler’s saw is my pencil and with it I create details, varied line weights and movement. I use copper, brass and sterling silver, and hand saw or etch all of the details. At what point did your hobby become a business? – After a few classes, I had quite the collection of items. I opened up an Etsy shop just to try to make some money so I could continue to take metalsmithing classes. I honestly didn’t think of it as a business until I started getting request after request for custom-made items pretty regularly. At the recommendation of a fellow classmate, I signed up for my first art fair and Anatomical Element was born. How did you come up with a name (Anatomical Element)? – I wanted a name that could be used for any type of art whether it be jewelry, metal sculpture, or illustration. I like to find the elements of anatomy in everything, so the name really evolved quite naturally. What’s the most popular item in your online store and why? – The popularity of items varies. The uterus earrings have been a favorite lately, but anything with the lungs or heart is always popular because more people relate to these organs. Lungs can be representative of yoga instructors, musicians, singers, or those with a breathing disease such as pulmonary/cystic fibrosis. Many people tend to hide their invisible disability or illness due to social stigma. When the invisible becomes visible, what actually happens in the psyche? – I imagine it could be one of two things, great fear or great relief. It is scary to be vulnerable and open about an illness that makes us or our loved ones different. But on the other hand we no longer have to hide or pretend and can be open, answer questions and educate people. I find that most people who purchase my work are looking for a subtle way to start conversations and bring about awareness for invisible illness. What sort of feedback do you receive from the audience? Are there people who think you artwork is a bit scary, bizarre or grotesque? – My work depicts fairly basic anatomical structures, nothing is extremely lifelike or hyper-realistic, but I always get a few people who walk by my booth at an art fair and say gross. Generally people are very appreciative of the uniqueness and enjoy the learning aspect that comes with it. Your personal advice: How can we learn to appreciate our body, no matter what? – That’s something I struggle with myself! It’s a journey to figure out how to embrace what we’re dealt in life in regards to our health and wellness. I choose to educate via sharing and creating. If someone else can benefit from what I’ve learned from an experience or an illness, I want to share whatever I can. It helps give a deeper meaning to life and gives purpose to otherwise senseless hardship. I would love Anatomical Element to be my full time job again eventually. It’s hard to wear every single hat in a business, from designing and creating the items to marketing, to managing the books and correspondence. I do love my current job at the children’s hospital and how much I’m learning about different surgical procedures, but my heart will always lie with creating art.